Young, feisty Maisie Dobbs has recently set herself up as a private detective. Such a move may not seem especially startling. But this is 1929, and Maisie is exceptional in many ways. Having started as a maid to the London aristocracy, studied her way to Cambridge, and served as a nurse in the Great War, Maisie has wisdom, experience, and understanding beyond her years. Little does she realise the extent to which this strength of character is soon to be tested. For her first case forces her to uncover secrets long buried, and to confront ghosts from her own past. very well read excellent narration . 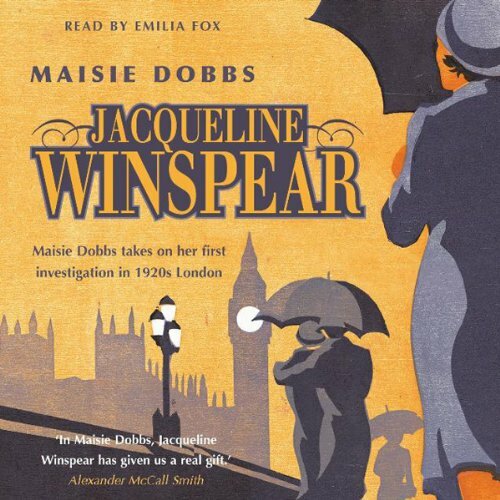 Emilia Fox has become my favourite narrator and I had much enjoyed reading the first Maisie Dobbs a few years ago. I could not recognise the novel upon listening to it and discovered to my dismay that it was THE THING TO KEEP AWAY FROM: AN ABRIDGED VERSION. What a pity! Please Mrs Fox, record more books! Thank you. Sometimes we all get fed up with the over-hyped new thriller or detective novel and feeling that way I decided to give a lesser known writer and her book a chance. I have to say the novel was enjoyable, informative and entertaining without being offensive. The story was simple and straightforward. There were no great twists and turns just a simple well told story which makes a nice change. I liked the additional bits and pieces of information. I also liked the attempt to view this period of history slightly differently than usual. Emilia Fox's made a huge effort to being this book to life for the reader and her performance was key to my enjoyment of this book. She tried to distinguish between characters for the listeners benefit. All in all, a very good narration. The book was a nice easy listen - not taxing - but very enjoyable. Don't rush through this book just enjoy listening to it. I first saw this book in a bargain book shop the "3 for £5" section and it put me off. If this book had received more attention it might have made an interesting television series. Met expectations. Good plot, good concept. Have no idea what else to write. I am sight impaired so find typing difficult.